Would you make a good diplomat? Take our career test to find out how you match with this and over 800 other careers. What is the workplace of a Diplomat like? A diplomat forms and maintains international relations with regards to issues of peace and war, trade and economics, culture, the environment, and human rights, and are also the ones who negotiate treaties and international agreements before they are officially endorsed by any politicians. A diplomat also has the ongoing responsibility of collecting and reporting information that could affect national interests, and is often in a good place to give advice about how the home country should react. He or she should also do their utmost to represent the views of the home government to the government of the country in which they are posted, and convince these governments to act in ways that the home government would prefer. In this way, diplomats are an integral part of the foreign policy formulation process. Modern diplomacy is very different from what it was, and is still changing. The role of a diplomat is therefore subject to change in the future. Are you suited to be a diplomat? Diplomats have distinct personalities. They tend to be enterprising individuals, which means they’re adventurous, ambitious, assertive, extroverted, energetic, enthusiastic, confident, and optimistic. They are dominant, persuasive, and motivational. Some of them are also artistic, meaning they’re creative, intuitive, sensitive, articulate, and expressive. Does this sound like you? Take our free career test to find out if becoming a diplomat is right for you. While some diplomats remain in their home countries, the majority are posted to overseas embassies and consulates in various places across the globe, but a diplomat's work will take them outside of the office. Diplomats may travel to the UN Offices in Geneva or headquarters in New York, or to the homes or offices of heads of state. Commonly, a diplomat will only spend a period of approximately three years in one country, but this can vary depending on the availability of vacancies. Most diplomats will serve in at least one developing country, where there are higher rates of disease, harsh climates, or social unrest. Some home comforts or amenities might become very hard to come by, and family or spouses who accompany diplomats are not often entitled to work. However, diplomats are often considered members of an exclusive and prestigious occupation, and a state will often give a lot of support to the high status, privileges and self-esteem of its diplomats in order to maintain its own international image. Since diplomats are very carefully selected, they are held in this high regard by members of the community. 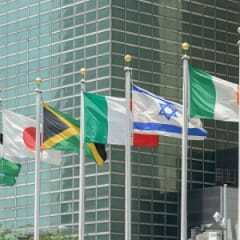 International law grants diplomats special privileges and immunities.